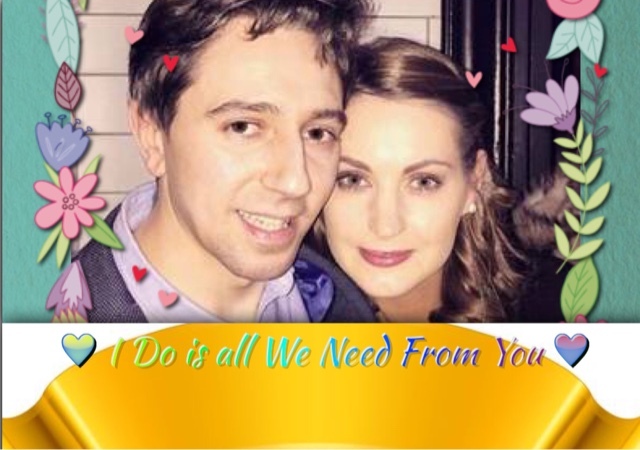 My sincere congratulations on your engagement Minister Harris / @SimonHarrisTD from the very core of my broken Pancreas, and we wish you a long and healthy life together. Now it's my turn, I'm on bended knee and I'd like to pop the question ? Will you improve our health service for better not worse. ? Will you give us the services and staff we require to manage and live with #Type1Diabetes and stay healthy ? Will you honour us people living with a chronic long term illness. ? Will you be faithful to your people in sickness and in health as long as we need to live ? The HSE now Spends More on Diabetes Complications than on Diabetes Services. Ok let me explain. We as a delegation representing of people with Type 1 Diabetes in Ireland went to Leinster house to brief our TD's on some facts about what life is like living with Type 1 Diabetes. Dr Ronan Canavan, Consultant Endocrinologist, retiring National Clinical Lead in Adult Diabetes. (Speaker) Grainne Flynn (Co Clare) Rebecca Flanagan (Galway) speaker Elizabeth Murphy (Waterford) Davina Lyon Dublin & Kildare (speaker) Ms Siobhan Horkan Who is the new programme manager for the HSE’s Paediatric Diabetes Clinical Programme. Because many of our children in Ireland with type 1 diabetes still need access insulin pump therapy, which is recognised as being the best therapy for managing this disease, Diabetes Ireland has told this to TDs and Senators in Leinster House. The Politicians that came to see us on the day were briefed at an event on Wednesday 22nd June in order to highlight the need for more resources in this area. Speaking at the event. Diabetes Ireland's chairperson and consultant paediatric endocrinologist, Prof Hilary Hoey, describes it as very frustrating that ‘the technology is there, she said "our children cannot access it'. We still see many children not getting access to insulin pump therapy, which is now recognised as being the best therapy for managing the condition, because there is no nurse available in the hospital to educate them on how to use and maximise the technology to most effectively manage their diabetes." She said that the charity has been working with the HSE for years in order to develop strategies for both paediatric and adult diabetes services. Last December, the then-Minister for Health, Leo Varadkar, launched a new strategy ‘which put forward a strong platform on which to build a high quality service with equity, local access and support for all children with type 1 diabetes and their families, regardless of where they live in Ireland'. But sadly "As yet, we have seen no progress on implementing this strategy," Prof Hoey told the politicians. Speaking at the event, consultant paediatric endocrinologist at Temple Street Children's Hospital, Dr Nuala Murphy, pointed out that consultant paediatric endocrinologists are now ‘urgently required' in Galway, Limerick and the south east of the country, while in Dublin, ‘paediatric diabetes services are overflowing with insufficient clinic capacity to deliver high quality care'. We have a shortfall of consultants, nurses and dietitians in each of our Dublin hospitals and with the new Children's Hospital pending, planning for these posts needs to happen now," she explained. Now here's the thing ! The TDs and Senators were informed that not a lot of extra resources are actually required for this. Currently, 10% of the annual health budget is spent on diabetes, but 60% of this is spent on diabetes-related complications, which are often preventable.
" If 0.4% (€5 million) of that annual spend was redirected towards funding the paediatric diabetes strategy, huge financial savings from preventing diabetes-related complications would be accrued in future years," Dr Murphy insisted. according to consultant endocrinologist at St Vincent's and Loughlinstown Hospitals, Dr Ronan Canavan, diabetes is costing the Government €1.3 billion per year, with over €800 million of that being spent on complications. TDs also heard from people living with Type 1 diabetes who also face barriers to insulin pump therapy, regular appointments and ongoing support. Ms Davina Lyon ( Me ) from Kildare and living with Type 1 diabetes said “I manage my condition as best I can each day with the support of my hospital team. I thought I was doing ok yet I recently received some blood results in relation to a possible developing complication of my diabetes. I am upset because I cannot get an insulin pump to improve my management as there is currently no training nurse in my hospital centre”. "We, as diabetes experts, know that we can reduce the staggering amount spent on complications each year. In the past few years, the diabetes community has worked with the HSE in reducing the cost of diabetes medications and devices, making financial savings Dr Murphy said and we believe him and so should you. "We need those savings reallocated to provide the manpower resources outlined to cope with the rising numbers and to encourage more effective daily management and better health outcomes." He added that a ‘multi-annual resource commitment' is needed to achieve this rather than the ‘annual cap-in-hand approach we all go through to try and get a few additional posts each year'. "In time, we will then see a reduction in annual diabetes complications spending, which will be good for the Exchequer and more importantly, our quality of life." Frank O’Rourke TD who was responsible for facilitating this briefing said “I am delighted to facilitate this opportunity for Diabetes Ireland. Obviously, the diabetes community has really come together and developed plans to cope with the rising prevalence of diabetes. It makes absolute sense to me, as a public representative, to consider multi-annual investment and stem the €800m annual spend on avoidable diabetes complications. Type 1 diabetes is an autoimmune condition that is not related to weight or a sedentary lifestyle. It is not preventable or reversible and is most commonly diagnosed in childhood, but is also diagnosed in Adults. For further information and interviews with commentators, please contact Diabetes Ireland.